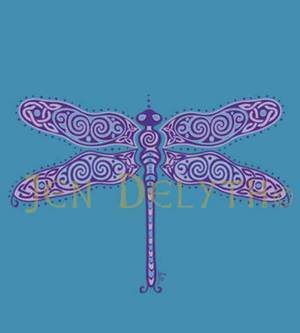 Dragonfly is master of illusion and the mystical realm of color, whose wings reflect and refract the power of light. Dragonflies begin their lives upon the water, and they transform and grow to become shaman creatures of the air. Swift flyers with brilliant control and darting speed, they are minature dragons of the faerie realm. Associated with emotion and passion (water), they also represent mental clarity and control (air). Dragonfly is a symbol of transformation and change and represents creative imagination, and the insight of clear vision throughout our illusions.